Viajar en lancha rápida le permite ver más en menos tiempo, mientras que un grupo pequeño reduce el tiempo de espera de la cueva. We had such an excellent time on this tour. While the water was very choppy on our way to Brac, our Skipper and his companion, Vanna, made sure we arrived as comfortable and safe as possible. The islands were breathtaking and the weather cleared up enough so we could go swimming in the Blue Lagoon (in lieu of the Blue Cave - the waves were too high and it was closed). Due to the Blue Cave being closed, we were refunded as well, for the cost of that attraction. We highly recommend this experience for anyone who loves to explore and to see a few of the over 100+ islands of Croatia! It should be advised when windy, sitting in the back left will leave you soaked. Dress for wetness, wish there would have been a notice about this. 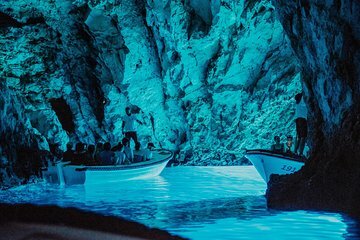 Itinerary was changed as blue caves were closed, but they did issue a refund for that portion. Boat was not great. Got wet while coming back. Couldnt enter the caves due to high water level, even though the weather was sunny and the skies were clear. The pace was a bit too much for us. We did nto get enugh time to explore the islands. We either had to choose between having food or exploring the islands, so that was a bummer. unfortunately the tour company could not do this tour exactly due to the weather, however we did still have a lovely day out and the company issued a refund for the difference in cost without me having to ask. Spiro and Barbara were great guides for this day and the speedboat was brilliant fun and expertly piloted by Spiro who seemed to be much quicker than the other boats :. The islands are beautiful and the stops for swimming and snorkellng perfectly timed in the beautiful blue waters off the coast. A great day out. The tour was so worth it and is the highlight of our stay in Split! Love the speedboat, and the music made it even more wonderful! The islands, which we were given adequate time to spend on, were amazing. The only thing was we arrived in Split at 5:30pm, which was different with information provided I think? But overall we did enjoy it! This trip was awesome, and our guides Mia and Toni were great! We loved the speedboat, and getting to see the blue cave and the nearby islands. Definitely recommend this tour! This trip was a highlight during our honeymoon in Split! We enjoyed seeing the many different islands and there was plenty of time to swim in some amazing bays. Since it is a speedboat, the trip is a bit bumpy, but we had a great time. Some of our favorite swimming spots were discovered through this tour. I would recommend this trip to anyone who wants to get away from some of the crowds while vacationing in Split. We had SUCH an incredible day on this tour -- our favorite day of the trip to Split. We loved exploring the islands and learning about the uniqueness of each of them. The Blue Lagoon snorkeling and swimming in the Cove were our favorite experiences. We would recommend definitely asking to use the snorkels every time you pull up to an island. We did make the mistake of sitting in the back row -- if you don't want to get soaked on the boat rides, don't sit on the back bench!! Luckily we found it more hilarious than anything, us being completely soaked the whole time. But if you don't like getting your hair/face/everything wet-- don't sit in the back and wear the jackets!! OVERALL-- amazing day, definitely worth the time and money.